Influencer marketing can be a great tactic to help get your store to another level. Brand reputation is certainly needed when creating something that people can trust. However, all of this goes for naught when you don’t have the right plan in place to keep everything moving in a steady manner. That’s why we’ve come up with a good guide to help you get the ball rolling with your ecommerce site. This will help you create more longevity in your brand. First of all, we’ll give you some foundational knowledge into influencer marketing and how it can assist you. What Is an Influencer Marketing? When it comes to influencer marketing, it’s all about finding the key leaders who can spread a brand’s message just through their own authority. Instead of trying to implement your message to a wide audience, you can hire the right influencers who will spread your brand further. The reason why is because people trust those that actually have a significant impact in a particular market sector. Not to mention, they have more of a social embrace that will allow them to interact and reach people easier than a company. This is certainly the case if they have a great base in their social media channels. While the term might be a bit new, the concept has been around for years. Think of all of the celebrity endorsements, from actors, sports entertainer, or even a leader who has a widespread audience. The great thing about having this type of marketing is that they can get in touch with their core supporters through different media, such as social/video marketing, tv, and radio. Businesses have found dedicated a big budget to get these in order. The Kardashians are a prime example of putting this into play. Through their social following combined, they can reach nearly a billion people. That’s why companies would seek them out most, because their audience truly respects their opinion. They’re trending, which means that people will take on their action, from endorsing a clothing line,, using a specific hair or makeup product, or even drinking a tea for weight loss. In these days, it’s not just about the brand, but their association. What types of things make them tick? When you get a powerful co-sign from a big time celebrity or influencer, that holds a lot of weight. Social media has certainly made this possible. Look at a huge YouTube star like Lilly Singh(Superwoman). From gaining big endorsements, creating viral YouTube videos with stars like John Legend, The Rock, and Will Smith, and now with a late night talk show due on NBC entitled, “A Little Late Night With Lilly Singh”, the sky’s the limit when it comes to opportunities from influencer marketing. That all stems from just her 14 million followers on YouTube alone. Brands recognize that this has a lot of power, and they aren’t afraid to seek out the best. Not only does this bring more legitimacy to their brand, but it also helps them become modernized. They’ll be able to identify with their target audience in a cooler way. This gives their brand a bit of style and uniqueness. That added flair can help build their brand into something more stable for the long-term. Here are a few reasons why you should implement influencer marketing in your brand. There are a number of benefits of implementing this strategy into your brand. When it comes to a business, reputation is everything. When you have someone’s trust, it’s a lot easier to sway their decision. This is especially the case when you’re able to genuinely capture one’s interest. This could be from associating yourself with someone popular or a person that’s recognized for their truth. It’ll create more attraction to your brand due to them endorsing what you have to offer. Another reason is due to relevancy. It’s important that you know your value and your audience. When working with someone that caters to your particular niche, this makes your marketing more focused. For example, if you were to sell clothing, a person that has a distinctive look and eye for fashion would be the perfect representative to endorse your product. The people that follow the person with an eye for fashion and the right look will make it easier to sell your particular clothing design. When you have a particular message that needs to be seen, you give your customers some great value that they’ll continue to appreciate. Nothing can make your brand more powerful than providing great value. At the end of the day, you want to ensure that any customer you cater to leaves with something solid they can appreciate. For a lot of people, it could be a tangible item that they’re able to keep for a while. Others might just appreciate something that gives them great information. That’s why it’s important to find people that can represent your company in the right manner. It’s all about aligning yourself with something that can add a dynamic light to your brand. When you have something that’s truly authentic, that can help your target audience find you after weeding through all of the clutter. Additionally, this is a faster way of building conversions. Due to the fact that you’re already catering to your target audience, this makes the conversions go by a lot quicker. They’re interested in what you offer, so this’ll be a win-win situation for both parties. Also, it’ll be easier to gain new customers while keeping your current satisfied. Also, this method doesn’t force someone to your brand. It’s better to catch flies with honey than vinegar. By forcing or getting in their face about the brand, they may not be as receptive to what you have to offer. However, an influencer that the audience trusts will make it easier for you to acquire customers. It’ll be a more natural feeling for them, especially if they’re more prone to use social media. They can view it on their mobile device and go back to the post later after they’re done with their busy day. Thinking of a platform to use for your influencer marketing? Why not use WooCommerce? With the advent of technology, it makes our experience a lot easier to handle, especially in terms of developing content. Woocommerce is a good one, because it can combine your ecommerce store with the ease and power needed to sustain a quality brand. You’ll be able to upload files and get started immediately. What began as a small company in 2011 through the WooThemes platforms has grown into something to help you create your ideal store. Over 6 million people have downloaded this program. Here are some things to note about this particular software. Whether you’re a small or large business, this is the type of one size fits all kind of program. It makes things accessible for all people to use, and you don’t need to get everything decoded like a rocket scientist. From having some affiliate products for sale or a health item, you can create a strong storefront to cater to your customer base. Stay afloat to analyzing sales reports, keeping track of customers, and other information to stay a step ahead of the rest. Of course, there are some free ones out there when you’re starting out. When you’re beginning to test the waters with your program, this is a good way to get your foot in the door. Also, if you do want some professional themes, they’re a lot of great ones available to help you step your game. Remember, the look and feel of your store can not only help people navigate through your site, but it also adds the right touch to give you more personality. This gives you a place to be proud of to help you sell your bread and butter. Not to mention, you’ll have better compatibility between you, your customer base and even the developers. Synergy is very important to help establish things well. While there are some good ecommerce stores on the market, this doesn’t necessarily mean that they’ll have longevity like ones with great features that resonate across the board. You can customize and develop different things without being an expert coder. Even if you do require the assistance of a professional, they’ll make things easier to help you accomplish your goals. This will enable you a degree of real say so in terms of how you want to make sure your site best for you and your customers. You can keep things either complex or simple. At the end of the day, you want this type of flexibility to help you stay afloat on the market. The developers are there to help you each step of the way. With that being said, here are some steps to help you get started with your influencer marketing campaign on WooCommerce. While creating an influencer marketing program can be challenging, it all starts by finding a good affiliate software. Choose a good program like OSI Affiliate Software. Next, login at the admin section. Next, go ahead and start setting up the software. Acquire the “Get Thank You Page Code.” You can pick your options from the drop down section. At this point, select a good shopping cart that will match your store. 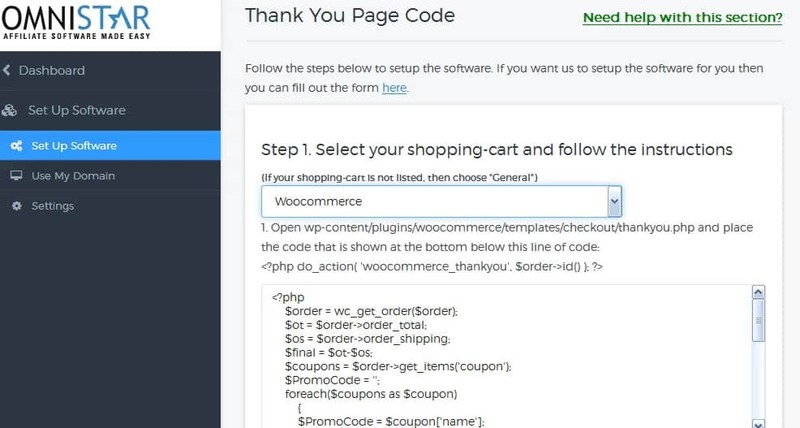 For this purpose, we’ll pick the WooCommerce option. All you have to do is scroll through all of the choices and select the right pick that’ll work well for your store. After you enter this in, you can test the integration. Go ahead an open everything in the new browser in Incognito mode. You’ll click the link to create a test user. Login as the test user. Now, you can get the referral link once you sign-in and make a test purchase through your online store. Afterwards, go to the admin section and see if you can see the reward for that user. This is a good way to preview things before you get your program in order. With a good influencer marketing program to help you with your brand, it’ll give you the right tool necessary to keep you relevant for the long-term. What are some reasons why you’d use this type of marketing to help with your ecommerce store? Please drop a note below. 0 Response to "How to Setup and Manage Influencer Marketing for Your WooCommerce Store"